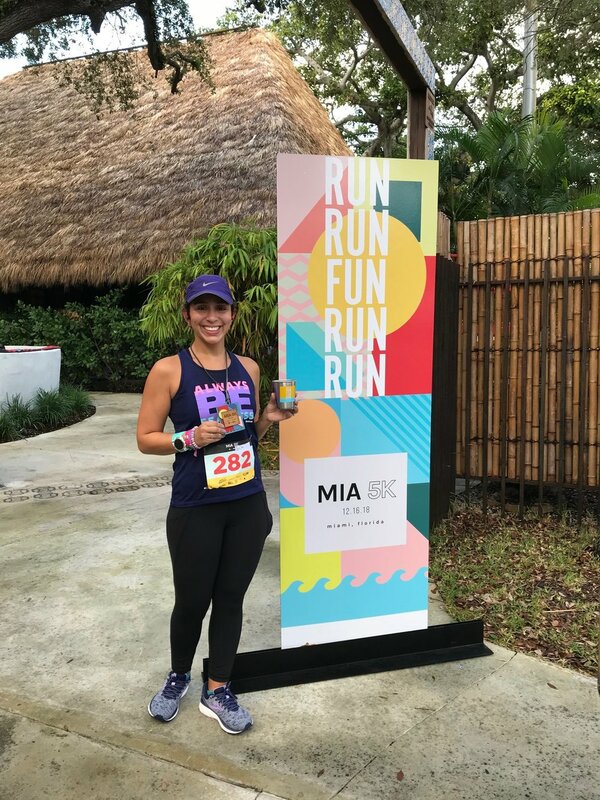 This is my second year running the MIA 5K (last year it was called the iRun 5000) and, just like last year, the race did not disappoint. The reasons I loved the race last year were still there this year, even with the course and sponsor changes. I signed up for the race back in June partly because I had a great experience racing the distance (something I rarely do) at last year’s event and partly because I knew this would be the one event where I would be able to see and catch up with a lot of my runner friends. Packet pick-up at the iRun store was quick and easy. Parking near the start line was easy to find (as of 6:00am) and there were clean, air-conditioned bathrooms, too. There were no race t-shirts this year, but the event organizers made up for it with the wooden medal and the metal beer cup. The race started right at 7:00am and the course was one big loop in the Upper Buena Vista neighborhood. There was a water station near the mid-way point of the race and the course itself was wide enough to allow for passing. What I liked the most about the course, other than it being flat, was that because it was a loop, I got to see the lead pack of runners; talk about inspiring and motivating! I had no intention of racing this race as Sundays are my rest day, so when the race started my goal was to do whatever felt good and kept me in good running form. Although it was humid, the legs felt great and the mind was focused on finishing. Part of what I don’t like about racing 5Ks is that I have to go hard from the get-go and, just when I’ve found my groove, the run is done. During the race, however, I embraced the distance and my focus on finishing actually helped me stay strong and consistent throughout the run. I finished the 5K in 25:32 (8:14 avg) and that time includes stopping for hugs from my lululemon Brickell City Centre family at the 2.5-ish mile mark. I was really happy with this time because (1) I felt great, (2) I felt in control, and (3) I didn’t feel like death at the finish line. iRun and lululemon spoiled the runners with the finishers area swag: Jaguar Therapeutics was giving massages, Veza Sur Brewing was handing out beers, and Cafe Creme fed the runners pastries and fruit. And, just like last year, I was able to catch up with a lot of my runner friends that I hadn’t seen in a long time (shout out to Dana and Jackie!). The MIA 5K is a race I will be doing again next year. From the race’s organization to the course to the socializing, this is a race made for going after your personal best time and catching up with your favorite runners while drinking good beer. Next up for me is my trifecta of half marathons: Miami (January), Princess (February), and 305 (March).